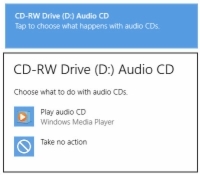 If you want to rip CD files into the MP3 format in Windows Media Player in Windows 8.1, you have to change the settings inside Windows Media Player. Don’t worry; it’s easy if you know how. 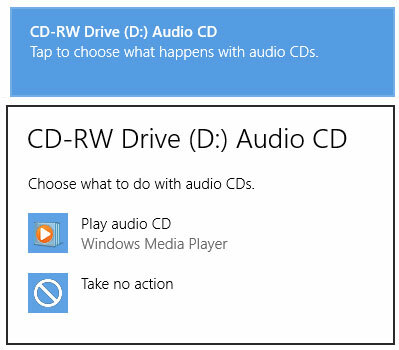 1Put the audio CD that you want to copy into the CD drive. Windows responds with notifications like these. Sooner or later you end up in the Library view of Windows Media Player. 2When your CD starts playing, press the Alt key, and then choose Tools→Options. Then click the Rip Music tab. You see the Rip Music tab of the Options dialog box. 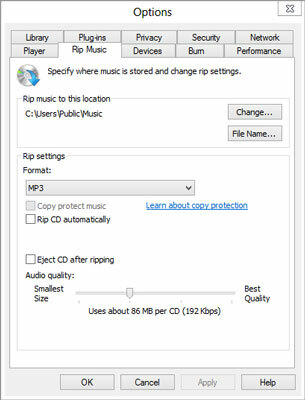 In the Rip Settings Format drop-down box, choose MP3. 3(Optional) In the Rip Music to This Location box, tap or click the Change button. Navigate to your Public Music folder (probably c:UsersPublicPublicMusic) and click OK. 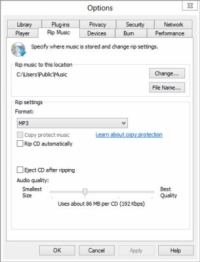 This step ensures that the audio files you rip end up in your computer’s Public Music folder, where other people using your computer and other people on your network can find them. Of course, if you’re the only one who listens to the music on your computer, you can skip this step. Or you can stick the ripped music on SkyDrive. 4Slide the Audio Quality slider over to 192 Kbps or 256 Kbps. At 192 Kbps, the quality of the songs you rip is close to the original quality of the CD recording. If you don’t mind making your files bigger for higher-quality songs, choose 256 Kbps or even 320 Kbps (which is indistinguishable from the original). 5(Optional) If you’re trying to rip a really scratchy CD and don’t mind allowing WMP extra time to try to recover all the music it can possibly ferret out, on the Devices tab, click your CD drive and then click Properties. Select the box marked Use Error Correction and click OK.
6Back in Windows Media Player, make sure that Windows Media Player has correctly identified the name of the album and all the tracks, er, songs. If any information is missing — rare, even with obscure CDs — right-click the incorrect entry and choose Find Album Info. WMP phones home and retrieves as many matches for the album as it can find. You can then choose the correct album or right-click the track, choose Edit, and type your own information. 7(Optional) If you want to choose specific songs to copy, select the check boxes to the left of each track that you want to copy and deselect the check boxes next to the ones you want to leave behind. To rip all tracks (copy all songs) on the CD, you don’t need to do anything. 8Click the Rip CD link. The Rip settings are sticky, so after you set them correctly, there’s no need to reset them. Thus, the second time you rip a CD (and all subsequent times), you can click Rip Music and rip away. 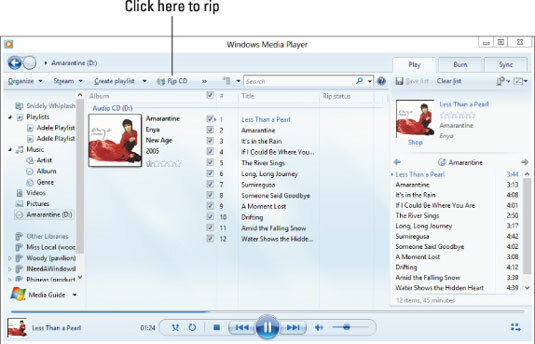 Windows Media Player dutifully copies the tracks you selected, placing the ripped files in the default folder, which is your Public Music folder. Because you ripped the album into your Public Music folder, your newly ripped album appears in the Music library list (if you’ve expanded your libraries), and in the Windows Media Player Library list, for you, for other people who use your computer, and for anyone who can connect to your Public Music folder. Even Macs on your home network can get to it. Smart, eh?